Get more facetime with friends and family at your next slumber party, weekend getaway, or afternoon at the Replay. 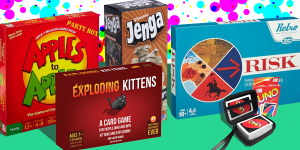 Starting Monday, May 14, you can check out board games from the library. Located in the Atrium, our new, all-ages collection includes both modern and popular classics that focus on strategy, role playing, and cards. Help us add more games. What are we missing? Send us a suggestion.